In spring we spotted a multitude of birds on the Birding Tours of Bryant Park. The month of May saw a BPC staff member rescue a Common Yellowthroat from a busy city sidewalk, and a couple of ducks enjoying the lawn on a rainy Friday morning. 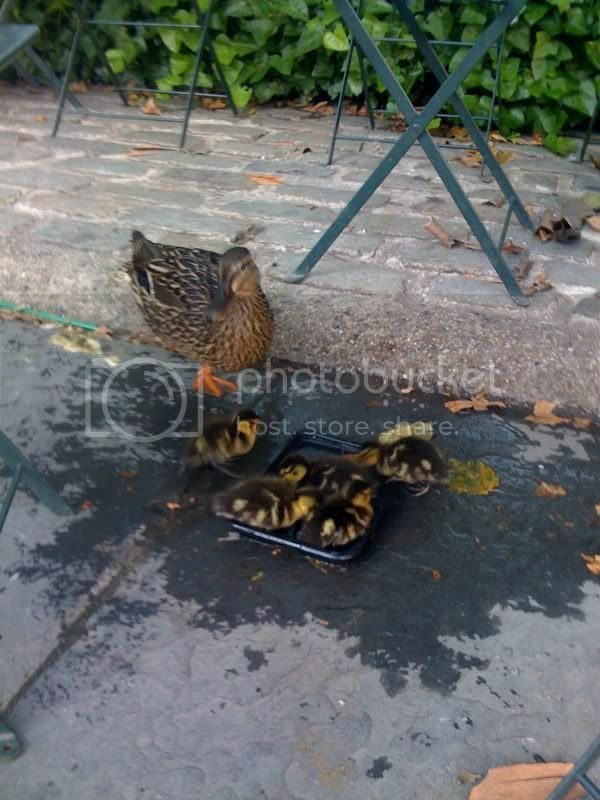 Last Sunday, July 12, we made our cutest avian sighting to date: ducklings! Undeniably more adorable than their full grown counterparts, these ducklings automatically jumped to the top of our on-going “strangest things we’ve seen in the park” list. 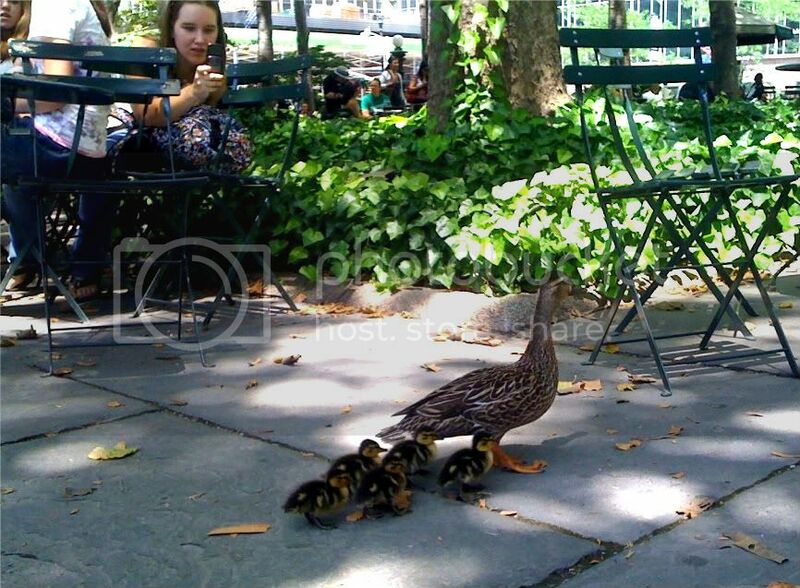 According to Sarah, BPC’s Assistant Director of Events and a pro duckling tracker/photographer, the little family first appeared in the 42nd Street Allee, near the Reading Room. 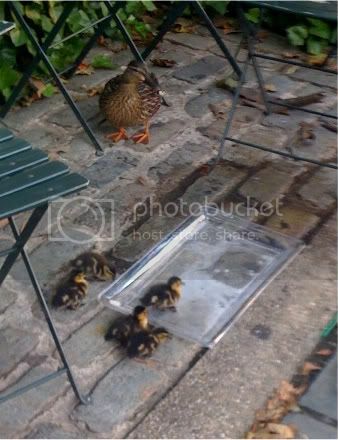 Sarah followed as the mother duck lead her five babies to the Fountain for water, but quickly realized they were too small make it over the tall ledge. The annual Obon Dance Festival was in full swing on the Fountain Terrace and audience members who noticed the odd sight began to gather and take pictures, prompting the mother to head back to the 42nd Street Allee, hissing at anyone who got too close to her children. 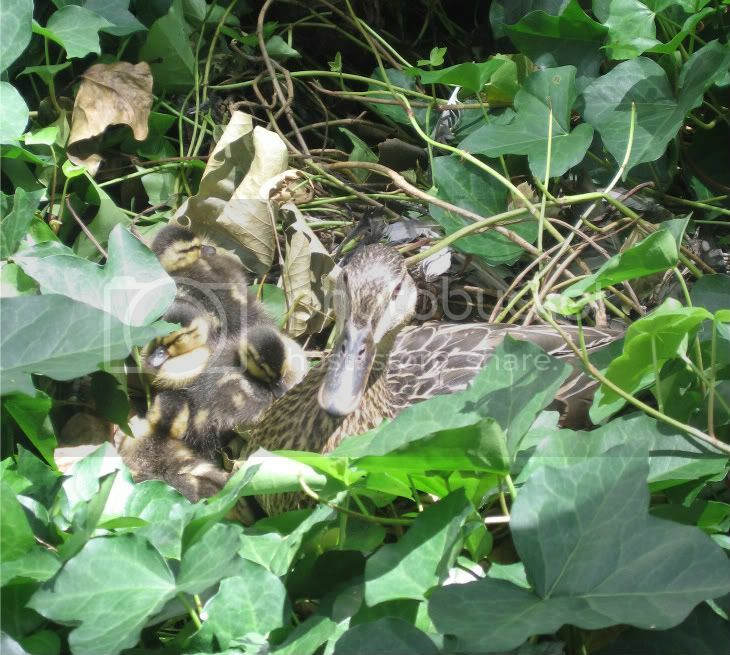 She ducked into an ivy bed for shelter and the babies huddled around her. 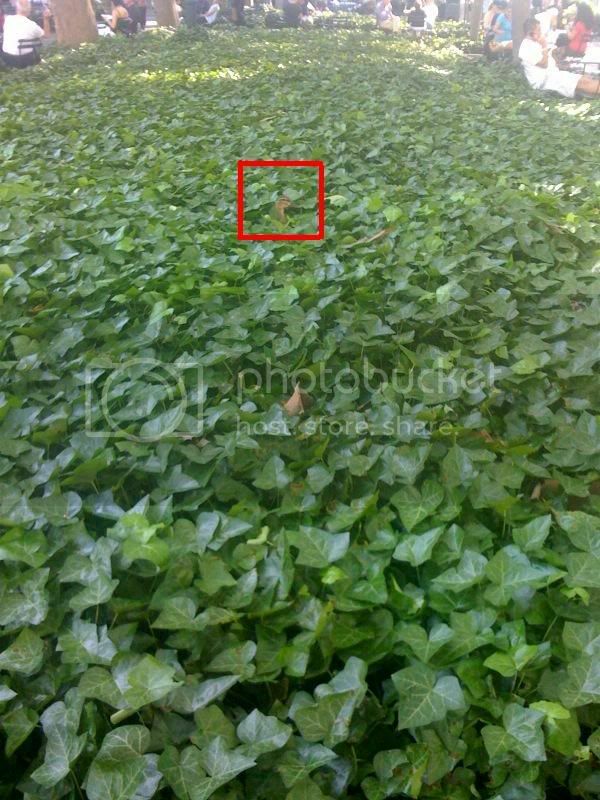 Once in the ivy, most park patrons were oblivious to their presence. However, if you looked closely enough you could see the mother duck’s head pop up from the foliage every few minutes. Sarah was determined to have the little family relocated to a more appropriate park by the end of the day, but their appearance on a Sunday made it difficult to establish contact with a park ranger certified in duck relocation (who knew it was unlawful to move ducks without a permit?). Research on Google Images helped us determine that the ducklings were probably only a day or two old. Our theory may be full of holes, but we believe they could have been the offspring of the ducks we spotted in May, and hatched in one of our ivy beds that morning. To prevent the little ones from waddling around the park in search of water, we placed two make-shift wading pools next to their ivy bed which they took advantage of almost immediately. Without qualified assistance to move the ducks, staff members on-site reluctantly left for the evening, with hopes to see them safe and sound in the morning. Much to our disappointment, the next day they were nowhere to be seen. Aside from a small mess left on the bluestone, they were a nice addition to the park for an afternoon and certainly a strange sight to see in Midtown. If you saw them or have any idea what may have happened to them, please let us know! Check out the ducks appearance on yesterday’s New York Times City Room Blog.